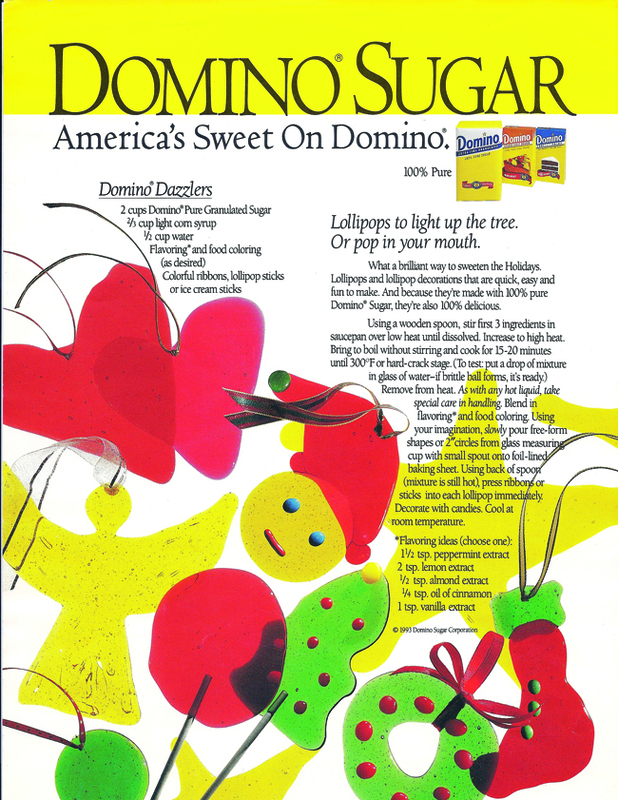 Many years ago I was hired for a food styling job for a Dominoes Sugar billboard campaign. They supplied me with their recipe for hard crack candy, which can be used in making lollipops. The premise of the campaign was that anyone can make them, and that free form lollipops are fun. Given the parameters of both holiday and everyday themes, they asked me to come up with forms that would serve their vision and could be incorporated into their ads. I used regular lollipop sticks for some and knotted ribbons in others, for hanging adornments, ie. Christmas trees. I had tons of fun creating many lollipops and learned so much in the process. My mother had a passion for unique & interesting Christmas tree ornaments, so I wrapped selected be-ribboned lollipops with waxed paper and stored them boxed in plastic in a cool dry place until Christmas, as a present to her. The translucence of these colored candies lend a lovely light quality to any occasion. The stick versions make fun centerpieces in a vase, or wrapped in translucent candy bags, tied with ribbons as party favors. The accouterments (sticks & bags) can be had at gourmet cooking stores. I will guide you through the process of making free form lollipops with all the helpful styling and safety tips I learned along the way. Here is what the ad looked like. For safety sake, fill a large bowl with ice and water as an ice plunge, and have it nearby in case you splash any hot candy on your skin. If you do, plunge your skin immediately into the ice water. Prepare sheets of aluminum foil on cookie sheets or straight on the counter, to receive the liquid candy. Have lollipop sticks, knotted colored ribbons and small candies ready to stick into hot candy lollis. The candy cools right away, once poured, so do them one at a time. You can re-heat the candy in the Pyrex in a microwave oven if the liquid gets too thick to pour easily. In a metal sauce pan, combine the first three ingredients together, stirring over low heat until they are completely dissolved. Increase to high heat. Bring the mixture to a boil for about 15- 20 minutes, without stirring, (the quicker the better to avoid discoloration) . Using a candy thermometer, or fryer thermometer, let the mixture just come to 300′ F, hard crack candy stage. Remove from heat. Blend in flavoring and color, stirring carefully. Half way fill a one cup Pyrex liquid measuring cup to use as a pouring vessel. Never over fill your poring vessel! Pour shapes according to your own imagination and quickly add ribbons, sticks and candies. To make them Kaleidoscopic, as pictured in the intro photo, use the above recipe and directions to make sheets of your personal color palette, tinted hand poured candy onto smooth flat surfaces of foil. Let them cool to room temperature and break into small pieces. Place the pieces of each color separately onto appropriately large trays or plates, so that you can see the individual pieces. 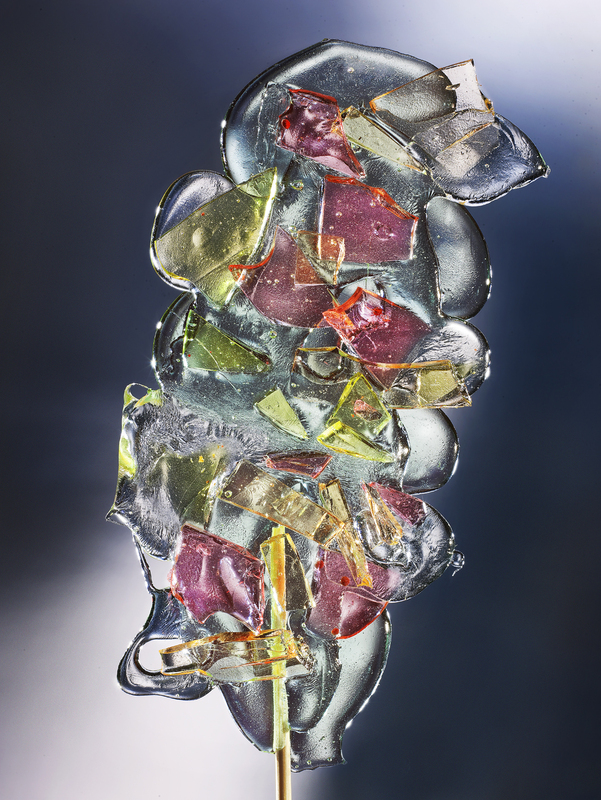 Make a batch of clear, uncolored candy and pour shapes, one at a time, on foil as before, placing the sticks in immediately, and adding the colored shards in the patterns you desire. 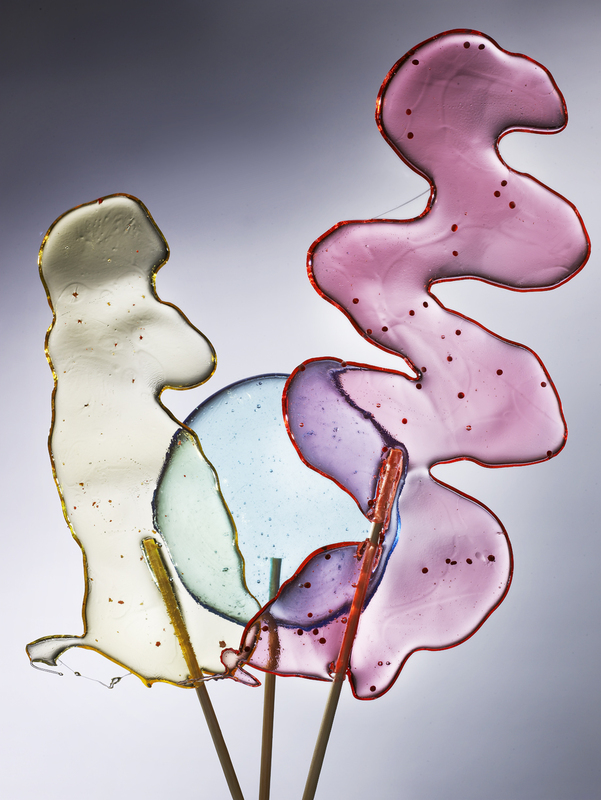 Re-heat some of the clear candy, and pour over your colored pieces to ensure they adhere to the clear base lolli. Extracts of; orange, lemon, grapefruit, vanilla, peppermint, cinnamon, hazelnut, almond, rose and lavender, or whatever you think of or find. Chicken Yakitori is sort of redundant since the word Yakitori in Japanese means skewered grilled poultry. Traditionally, Yakitori can be grilled with salt only or with a sauce called Tare. Hence, “Yakitori no Tare” is griled poultry with tare sauce. We westerners just call it Chicken Yakitori. Like BBQ sauce, Tare is often also served on the side for dipping. You can buy it ready made in a bottle or make it yourself. It can be used on any protein or vegetable sturdy enough to skewer and grill or you can also use it under a broiler or in an oven, for more delicate foods like flounder or ripe peaches. For a deeper flavor use it as a marinade before grilling and continue applying with a brush or squeeze bottle several times during cooking. The basic ingredients for Yakitori Sauce or Tare are; sake, soy sauce, mirin (a naturally sweet cooking rice wine), and sugar. You may also add any kind of stock you see fit for your choice of food. Great as a party pleaser, here is my recipe for “Yakitori no Tare” and suggestions for cooking and presentation. Don’t forget to soak your skewers in water while preparing the other ingredients. Mix all the ingredients together and bring to a low boil for about a minute and let cool. Set a little aside for dipping. Use the rest for marinating and brushing while cooking. Using only the centers of the scallions, cut 16 one inch lengths of the medium green parts of scallion. Reserve the dark green and white parts for other uses. 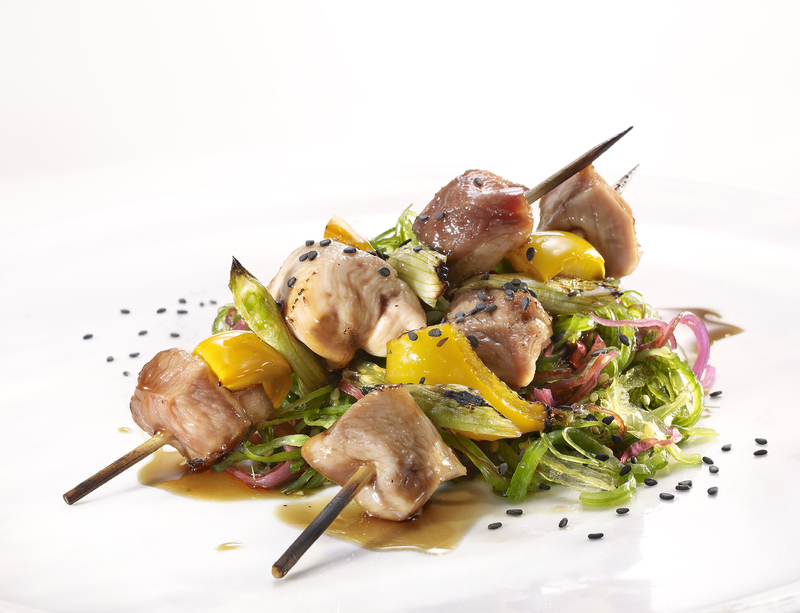 Alternate dark and white meat and vegetables onto soaked skewers, taking care to center the skewer in each piece so there is no breakage. Marinate in the sauce for 1 hour in the refrigerator. Grill gently over medium low heat for about 5 minutes each side, basting with sauce every few minutes. Check for doneness and cook more if needed. Cook until just done. Serve on a bed of seaweed salad and garnish with blacks sesame seeds. Cold premium sake or cucumber garnished Saketinis are great with this dish on a hot summer day, or anytime.